I was a tad cautious. I thought Rupu was a scam. Thanks for clearing that up. Am sorry to say this but Zetu’s design is an exact copycat of Twangoo SA. Here’s the link to prove it http://www.twangoo.co.za/cape-town. They even shamelessly copied their code almost word for word. I agree with your statement talking about the websites not being able to get past the middle/upper class users… another kenyan Groupon site is ” Sokopal” which I found thru an advert on facebook ( which is perhaps is a better way at getting a wider audience to register) though I still believe the deals target the middle/upper class users they need to target a wider range of vendors…. 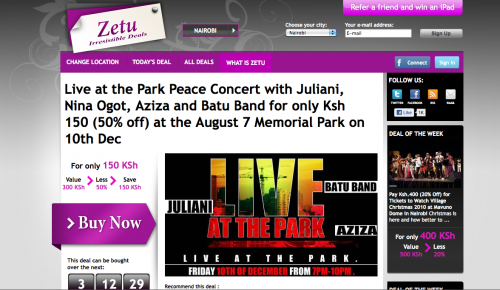 Zetu definitely is tops with the site design! I agree especially how Rupu almost replicated the Groupon look and feel! We did not shamelessly copy their code, we actually use the same code. Rupu seems to have money (newspaper ads and fancy offices) why copy ??? Rupu actually means ‘discounts’ and not ‘marupurupu’! There are more ‘Daily Deal’ websites popping up every day than there are deals it seems. Reminds me of the penny bidding websites that have shown no sign of abating. In the arena of ‘super critical mass’ driven business models, jumping in at this point is akin to joining a pyramid scheme at the behest of 5 friends who’ve already joined. A few thousand daily deal websites popped up the day after the much publicized bid for Groupon by Google. Of course there’s the other point… achieving Super Critical Mass itself is historically done by taking a sack of money (literally), and dumping it on in-your-face advertising. Very rarely has it been achieved otherwise – well, that’s unless you’re the pied piper of hamelin with magical social engineering skills. I personally think there’s more money in developing Groupon Clones than there is in copying their business model at this point. That’s the problem wit kenya. Every gud idea gets copied and then its a continuous rate race with no clear winner. @Crazywizard kompetishon is onli pluf that thea isi chapaa samwea. Nilicharipueko kale karupurupu chusi chuu nilikua nimetisama ofa tam sana ya kupikwa picha ya masaa kadhaa na elfu mocha tu! Nikaamua he! Wacha nikachukue haka! Kufika huko nikaamua kurok-in na Fasipook Konekiti. Pato wakaniulisa kama nawesa ingisha mambo menkine. Sawa, nikaingisha. Nikapika ota ya photoshoot kamocha tu, kaamua kucheki out. Kuponyesa ‘Cheki Out’ hifi tu… fomu inkine KUPWA kanatokea ati nikachase yote tena kapla ninunue pithaa! Nikawacha tu! Sokopal.com was actually the first Groupon like site in Kenya – its built from the ground up by Kenyan IT guys. 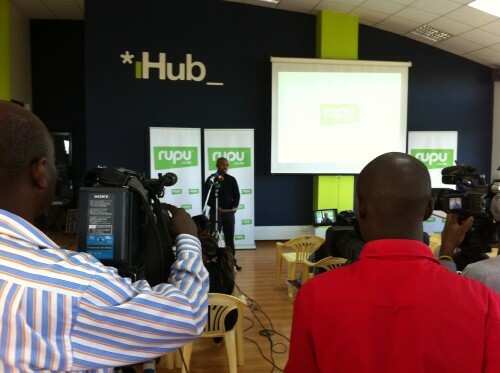 The big question is whether the groupon idea concept work in Kenya. It’s tough to know. I wonder whether Zetu and Rupu are making any money. I disagree with you. you say “At least Zetu has a different feel to it and gets points for originality”. Well, the truth is Zetu is 100% copy paste (even shamelessly including twangoo.co.za folders and files, color schemes and words). Is that what we call originality? Haki kuweni serious! While in a hurry to post my comment on how Zetu copy pasted twangoo.co.za, I realized that they are one and the same group and it’s quite logical that they look similar and share the same files. My apologies to Zetu team. Skeptism about new ventures is an inevitable part of business development.Rather than lamenting about the unoriginality of this idea,I think,especially young people,should embrace it,be the champions of change and innovativeness as it were….and moreover offer constructive and well intentioned critism. The challenge in my view,is getting enough businesses on board to offer their products and services at this group discount.Furthermore getting cutting edge new businesses that are themselves desperate for advertising would help. It would be beneficial too,if these sites were made known to families-especially young modern ones…who are always looking for a bargain when having family activities. Groupon just bought twangoo, which i believe is a pretty good deal. i wouldnt be surprised if they acquire rupu or zetu anytime soon..
forgot to add this.. if anyone wants to start their own groupon site, a quick google search on “groupon clone script” will do the trick. Sorry to say this but Rupu developers are pretty good at downloading stuff, their business strategy is pretty good though. @people give some credit to Rupu and Zetu……….n don’t be too quick to draw conclusion and to criticize!!!!!!!! !have u seen their CRAAAAAZY DEALS!!!!!!!! oh yeah!!!!!!!!! There’s another one in Kenya http://www.pennysaver.co.ke and its different, offering door-to-door shipping and has some unique items including consumer electronics, toys, cool items, fashion, beauty and more, not to mention also offers deals on services like all the others.